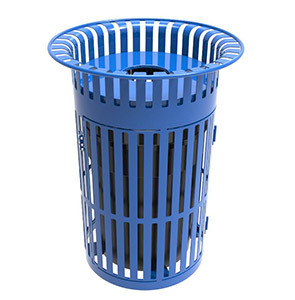 Traditional all-steel trash receptacles encourage litter free environments. These popular style round receptacles feature a latching swing door for easy, routine maintenance of the included heavy-duty plastic liner. 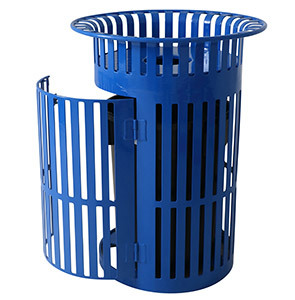 Fabricated with a flared top slatted steel base design utilizing 12-gauge steel, completely MIG welded and finished in a polyethylene thermoplastic coating—these waste receptacles offer prime structural integrity and longevity. Ready for portable and surface mount installation, available with a choice of flat top, rain bonnet or ash urn lid to suit diverse facility application requirements.